Now that you have decided to rewrite your resume, you have the dreaded task of sitting down at the computer and pulling up either an ancient resume or starting with a blank document. 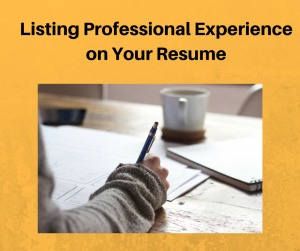 Either way, you need to start thinking about your work experiences and what will be included in the Professional Experience section of your resume. Here are some tips to think outside of the normal work history that has been traditionally included in your past resume drafts. Tip #1 – Yes, include your jobs, but not all of them. The first—and most obvious—things to include in professional experience section are your actual paid jobs. Start with your most recent job first and then go backwards to your earlier positions. Remember that you don’t have to go back more than 10-15 years with your job history. Not all of your past jobs are relevant towards your future career goals. Tip #2 – Consider your volunteerism as professional experience. Just because it’s professional experience doesn’t have to mean that it is paid experience. If you are looking for an accounting position and currently serve as a bookkeeper for a community-based organization, then include that information in your professional experience. It most definitely counts. Tip #3 – Discuss leadership roles in professional organizations. If you have worked with cross-functional team members, led a comprehensive project, or generated a large amount of funds for a non-profit organization, then include that, too. These are skill-sets that can be utilized in almost any job that you apply toward in the future. Tip #4 – Include internships (if they are fairly recent). If you are a new college graduate, it is highly likely that you won’t have a great deal of professional experience that directly relates to your degree field. However, you probably have at least one internship that you secured during your time in college. Consider adding your internship experience as professional experience – just because it was early in your career doesn’t mean it doesn’t count. Tip #5 – Focus on achievements. Perhaps one of the most important focuses in your professional history section should be on achievements and accomplishments. Whether it is your most recent job or your internship, think about the impact that you made with the organization and not just your responsibilities. Whenever possible, include information that discusses dollar amounts, percentages, and numbers—this always catches the reader’s eye. Remember that your professional history needs to focus on the relevant information that matters to a future employer. It’s vital that you focus on achievements that demonstrate the success you brought to your previous employers. Still have questions about this section of your resume? Contact me today for a free resume review! P.S. If you want MORE resume tips, download my FREE resume tips that GET THE INTERVIEW!